Radial tunnel syndrome happens when the radial nerve is squeezed where it passes through a tunnel, formed by muscles and bone, near the elbow. This is called the radial tunnel. Passing through the radial tunnel, the radial nerve runs below the supinator muscle. The supinator muscle lets you twist your hand clockwise. This is the motion of using a screwdriver to tighten a screw. 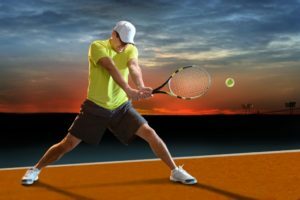 Is it radial tunnel syndrome or tennis elbow? The symptoms are very similar to the symptoms of tennis elbow. There are very few helpful tests for radial tunnel syndrome, which can make it hard to diagnose. One difference between radial tunnel syndrome and tennis elbow is the exact location of the pain. In tennis elbow, the pain starts where the tendon attaches to the lateral epicondyle. In radial tunnel syndrome, the pain is centered about two inches further down the arm, over the spot where the radial nerve goes under the supinator muscle. Radial tunnel syndrome may also cause a more achy type of pain or fatigue in the muscles of the forearm. The pain is caused by pressure on the radial nerve. There are several spots along the radial tunnel that can pinch the nerve. If the tunnel is too small, it can squeeze the nerve and cause pain. Repetitive, forceful pushing and pulling, bending of the wrist, gripping, and pinching can also stretch and irritate the nerve.